As I have become overwhelmed working on IEPs differentiating work for my students, getting prepared for a new student tomorrow, OPEN HOUSE on Thursday and many other things, I am sure all of you are going through as well. So today I am repeating a post from this summer that bears repeating as it is such a vital piece of what we do. CCSS.Math.Content.K.CC.B.4 Understand the relationship between numbers and quantities; connect counting to cardinality. CCSS.Math.Content.K.CC.B.4a When counting objects, say the number names in the standard order, pairing each object with one and only one number name and each number name with one and only one object. CCSS.Math.Content.K.CC.B.4b Understand that the last number name said tells the number of objects counted. The number of objects is the same regardless of their arrangement or the order in which they were counted. CCSS.Math.Content.K.CC.B.4c Understand that each successive number name refers to a quantity that is one larger. While this is a kindergarten Common Core skill, those of us in special education know we are often working on this skill beyond kindergarten age and grade level, so it's important to have many types of materials so kids won't get bored over time, doing the same activity. My students needing to master this skill are a mixture of grade levels; some kindergarteners and some older. How can I differentiate this concept? One way I can do this is to vary the product (outcome) I expect from the students in order to demonstrate their learning. I may need to have multiple ways to differentiate this within my group of students, also. So I need lots of options. Many of my kids groan anytime I show them a worksheet to do, but will volunteer to work on something if the activity looks like a game they can play. 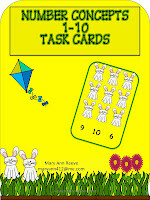 For one of my activities, I made a set of counting task cards. My kiddos love these! Now, I can look at differentiating this one activity's outcome. How can I differentiate the learning in order to make more gains in learning? I can differentiate by having them write down the answers on an answer sheet. Use them as task cards and attach clothespins to the correct answers. Place them in a learning center area or independent work area where I assign certain students to complete the cards. Following completion of the cards, I can check the student's work before they leave the work area. Assign certain sets of of the task cards (e.g. counting 1-5, counting 6-10) to specific kids so the materials meet their individual learning needs. I could also make them into a game such as the card game, War. With multiple sets of the task cards, you could teach a group of kids to play the card game, Go Fish. See game rules: http://www.bicyclecards.com/card-games/rule/go-fish. Its Marvelous Monday and here is your Freebie for today! Don't forget to check out our good friends at Classroom Freebies and Manic Monday! You never know what goodies you will find there! Great ideas for differentiating! I am a reading specialist, so I definitely understand where you are coming from. So glad you liked it! Thanks for stopping by Superteach's Special Ed Spot.